Join the discussion on our forums! 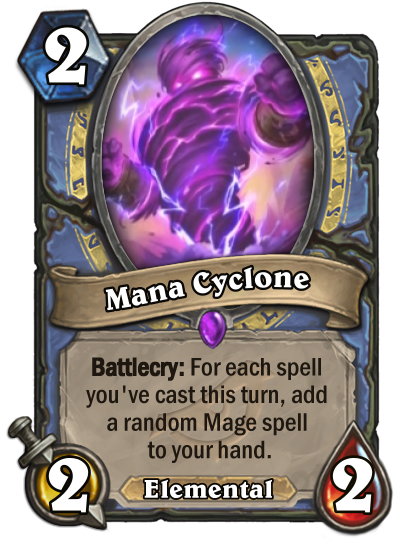 Come discuss Mana Cyclone over in our dedicated Mana Cyclone discussion topic. Battlecry: For each spell you've cast this turn, add a random Mage spell to your hand. It'll put a good spin on your spells. Love this card! I wish the tempo/burn mage archetype in which this is played becomes viable in the following year. This can go pretty insane with bunch of cheap spell especially if you consider discounts like Elemental Evocation and Sorcerer's Apprentice.